Staying at a Value, Moderate, Deluxe & Deluxe Villa Resorts? 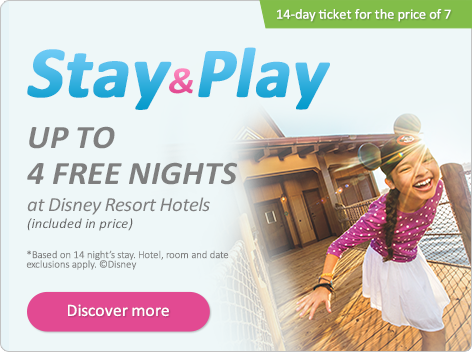 Stay at any Disney Resort Hotel and guests can receive up to 4 FREE NIGHTS on a 14-night stay. **Excludes arrivals 14 Apr – 25 April 2019 on Value, Moderate & Deluxe Resorts. **Excludes arrivals 01 July – 26 July 2019 on Value Resorts. "14-day ticket for the price of 7" Offer is available to book combined with other offers available. For this time the 14-day ticket (Disney's 14-day Ultimate Ticket) is available for the price of a 7-day ticket (Disney's 7-Day Ultimate Ticket) if purchased in one transaction with a Walt Disney World hotel stay (5-night minimum stays) for arrivals 1st Jan - 31 Dec 2019. Disney's 14-Day Ultimate Ticket expires 14 days from first day of use. Child ages 3-9 years (at time of use). "Free Nights" Offer is available to book from 03 Dec 2018 – 01 Apr 2019 for select arrivals dates from February 11 2019 – September 28 2019. Stays are subject to room availability. Eligibility for the Disney Free Nights offer requires a minimum length of stay of 5 consecutive nights, and a maximum of 21 consecutive nights at the same participating Disney Resort Hotel. Room Rates are not applicable to any nights after September 28, 2019. Price upon checkout includes FREE night offer. The number and type of rooms allocated to this offer are limited and subject to availability. Disney's Animal Kingdom Lodge, Disney's Beach Club Resort, Disney's Boardwalk Inn, Disney's Contemporary Resort, Disney's Grand Floridian Resort & Spa, Disney's Polynesian Resort, Disney's Wilderness Lodge and Disney's Yacht Club. Disney's Animal Kingdom Villas, Disney's Beach Club Villas, Disney's Boardwalk Villas, Disney's Old Key West Resort, Disney's Saratoga Springs Resort & Spa, Boulder Ridge Villas at Disney's Wilderness Lodge, Copper Creek Villas at Disney's Wilderness Lodge Disney’s Polynesian Villas & bungalows. Disney’s Art of Animation Resort - Little Mermaid Standard View(VA), Polynesian Villas and Bungalows – Bungalows (MW), Copper Creek Villas – Cabins (Room Type 2K), Bay Lake Tower at Contemporary, the Villas at The Grand Floridian Resort, 3-bedroom villas, suites, and campsites.